Looking for expert advice across the areas of sales strategy, personal development and motivation? Whether you’re a relative rookie when it comes to the sales game or a seasoned professional, there’s a book, heck there’s 47 books here for you! We set a data analyst loose on the big sales communities of Reddit and Quora. After a huge data trawl of every post on those sites (the guy hasn’t slept in days!) he has pulled together the definitive list of the most recommended sales books of all time! We’ve ranked our findings according to the number of recommendations, sentiment and votes, with the numero 1 being awarded the accolade of(drum roll), ‘The Greatest Sales Book of All Time’. Below are the most recommended sales books of all time. Enjoy. With wit and authority, Neil Rackham explains why traditional sales models don't work for large sales. With supreme clarity, he unfolds the enormously successful SPIN strategy, using real-world examples and informative cases. You may find the techniques controversial; they often go against the grain of conventional sales training. How to Win Friends and Influence People is one of the first best-selling self-help books ever published. Emphasizing the use of other's egotistical tendencies to one's advantage, Carnegie maintained that success could be found by charm, appreciation, and personality. Daniel Pink explains why extraverts don't make the best salespeople, and shows how giving people an ""off-ramp"" for their actions can matter more than actually changing their minds. Along the way, Pink describes the six successors to the elevator pitch, the three rules for understanding another's perspective, the five frames that can make your message clearer and more persuasive, and much more. The classic book on persuasion, explains the psychology of why people say ""yes""—and how to apply these understandings. You'll learn the six universal principles, how to use them to become a skilled persuader—and how to defend yourself against them. The Ultimate Sales Machine shows you how to tune up and soup up virtually every part of your business by spending just an hour per week on each impact area you want to improve; sales, marketing, management, and more. "This is more of a general business book that focuses on sales and marketing. It will teach you to be more strategic about how you do sales (i.e. it's more than a numbers game)"
How I Raised Myself from Failure to Success in Selling. Bettger reveals his personal experiences and explains the foolproof principles that he developed and perfected. He shares instructive anecdotes and step-by-step guidelines on how to develop the style, spirit, and presence of a winning salesperson. No matter what you sell, you will be more efficient and profitable—and more valuable to your company. Here in a short, compact and concise format is the basics of how to persuade more people more effectively, more ethically, and more often. Mastery synthesizes the years of research Robert Greene conducted and demonstrates that the ultimate form of power is mastery itself. By analyzing the lives of such past masters as Charles Darwin, Benjamin Franklin, Albert Einstein, and Leonard da Vinci, as well as by interviewing nine contemporary masters Greene debunks our culture’s many myths about genius and distils the wisdom of the ages to reveal the secret to greatness. Cold Calling Techniques (That Really Work! ), provides you with all of the right tools for turning prospects into meetings, and meetings into big sales. This easy-to-follow guide helps you beat today's cold calling obstacles, such as voice mail, cell phones, and e-mail. Schiffman's professional experience and corporate wisdom guarantee your future success. The Secrets of Question Based Selling provides a step-by-step, easy-to-follow program that focuses specifically on sales effectiveness—identifying the strategies and techniques that will increase your probability of success. If you have no previous sales experience, this book can be your quickstart guide to B2B sales. If you already have a sales background, you'll find the step-by-step action guides, proven templates and detailed strategies helpful to take your sales game to the next level. Influence: Science and Practice - The comic! In this graphic adaptation of his best-seller, Robert B. Cialdini becomes society’s best hope in combatting compliance professionals throughout the world. He leads a team of special forces through a battleground filled with psychological sneak attacks designed to elicit pre-programmed responses from unknowing victims. Use data, technology, and inbound selling to build a remarkable team and accelerate sales The Sales Acceleration Formula provides a scalable, predictable approach to growing revenue and building a winning sales team. Customer Centered Selling teaches the secrets of the world-famous Xerox sales training by reversing the conventional selling practices of searching for customer needs, pitching product, and adopting an order-taking mentality. Jolles provides a systematic, repeatable, predictable approach that teaches how to anticipate and influence behavior by studying and understanding the client’s "Decision Cycle" and critical "Decision Points." Mike Schultz and John Doerr studied more than 700 business-to-business purchases made by buyers who represented a total of $3.1 billion in annual purchasing power. When they compared the winners to the second-place finishers, they found surprising results. Not only do sales winners sell differently, they sell radically differently, than the second-place finishers." Through the dialogue of the two main characters the authors have fashioned an entertaining story to present the key concepts essential to sales success. Readers learn... ...What it takes to outperform 92% of the world's salespeople ...That failing and failure are two very different things ... Why it's important to celebrate success and failure ... How to get past failures quickly and move on ...That the most empowering word in the world is not yes... it's NO! Selling to Vito contains all the tactics you need to get appointments with impossible-to-reach top decision-makers. They in fact are the Very Important Top Officers (VITOs), the people with the ultimate veto power who hold the key to bigger commission checks, every sales award you could possibly win, and VITO to VITO referrals that you can take to the bank! "Selling to VITO will give you a workable blueprint for effectively getting to the right person. I've tried it and I like the structured approach." This book conveys the experience of more than 500 men of great wealth, who began at scratch, with nothing to give in return for riches except thoughts, ideas and organized plans. Here you have the entire philosophy of moneymaking, just as it was organized from the actual achievements of the most successful men in America in the first half of the 20th century. There’s a template that the world’s fastest growing companies follow to achieve and sustain much, much faster growth. From Impossible to Inevitable details the hypergrowth playbook of companies like the record-breaking Zenefits , Salesforce.com , and EchoSign—aka Adobe Document Services—(which catapulted from $0 to $144 million in seven years). Doctors, housewives, ministers, parents, teachers … everyone has to "sell" their ideas and themselves to be successful. This new guide by America's #1 professional in the art of persuasion focuses on the most essential part of the sale—how to make them say "Yes, I will!" In this indispensable guide, we discover that sticky messages of all kinds–from the infamous “kidney theft ring” hoax to a coach’s lessons on sportsmanship to a vision for a new product at Sony–draw their power from the same six traits." Learn how to convert leads to sales, motivate yourself and motivate others, give killer presentations, and keep your sense of humor. In Sell or Be Sold, Cardone breaks down the techniques and approaches necessary to master the art of selling in any avenue. You will learn how to handle rejection, turn around negative situations, shorten sales cycles, and guarantee yourself greatness. Cardone will also teach you the success essentials of selling in a bad economy. • Keep It Simple, • Be iNvaluable, • Always Align, • Raise Priorities. Contrary to popular sales training, you don't have to make presentations to everyone who will listen. You don't have to be subservient, forfeit your self-respect, or fake enthusiasm about your product or service. In fact, you don't have to be enthusiastic at all. And, you never have to lie! Prospects never control anyone who has mastered David Sandler's revolutionary 7-step program for top sales. In You Can't Teach a Kid to Ride a Bike at a Seminar, you learn to master each of the fundamental principles of the Sandler Selling System - and how and when to use them. "I took Sandler for two years. I loved it then and still find the methodology extremely effective today. You could start with David Sandler's book "You Can't Teach a Kid to Ride a Bicycle at a Seminar" and then move to taking the classes if you like the material." "Cold calling" - making contact with strangers - is the biggest fear confronting businesspeople, especially those who work in sales and marketing. This book, based on a very successive course given to thousands of people, shows the art and science of making first contact with complete strangers. The secret is in the preparation and approach, rather than having the gift of the gab, that will enable even yellow-bellied chickens to make that call with confidence. How do you succeed in the profession of selling while also maintaining your sanity, avoiding ulcers and heart attacks, continuing in a good relationship with your spouse and children, meeting your financial obligations, and preparing for those ""golden years"", and still have a moment you can call your own? Zig Ziglar shows you how. If you specialize in complex sales, the business-to-business transactions that involve multiple decisions made by multiple people from multiple perspectives, this is the book for you! It presents The Prime Process—a diagnostic, customer-centered approach that clearly sets you apart from your competition and positions you with respect and credibility as a valued and trusted advisor. If the stakes are high and you’re expected to win, this book will give you the edge you’ve been looking for. If you’ve tried manipulative, self-focused selling techniques that demean you and your customer, if you’ve ever wondered if selling could be more than just talking people into buying, then Integrity Selling for the 21st Century is the book for you. Its concept is simple: Only by getting to know your customers and their needs — and believing that you can meet those needs — will you enjoy relationships with customers built on trust and reap the rewards of high sales. Rejecting manipulative tactics and emphasizing "process", Strategic Selling presented the idea of selling as a joint venture and introduced the decade's most influential concept, Win-Win. The response to Win-Win was immediate, and it helped to turn Miller Heiman, the small company that created Strategic Selling, into a global leader in sales and development with the most prestigious client list in the industry. "_Strategic Selling_ is a valuable book, especially for those of us who are not "salesmen" in the classic sense, but have to operate in the Complex Sales environment. Consultants and Client Relationship Managers will find it especially valuable." ACT when the time is right. Proven techniques to master the art of the cold call Cold calling is not only one of the fastest and most profitable ways to initiate a new sales contact and build business; it's also one of the most dreaded—for the salesperson and the recipient. Smart Calling has the solution: Art Sobczak's proven, never-experience-rejection-again system. 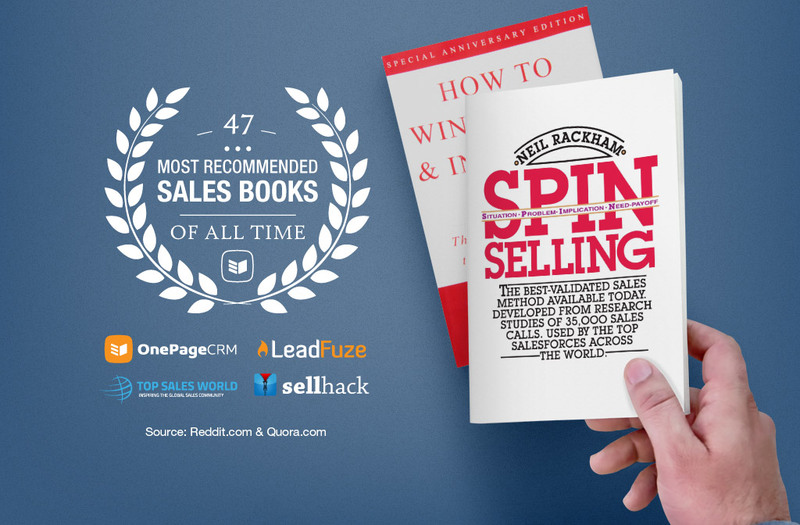 Source: [INFOGRAPHIC] The 47 most recommended sales books of all time!